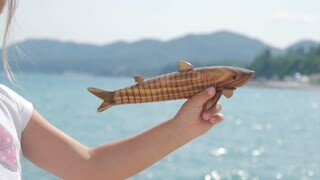 A child is playing with a toy fish on the background of the sea. Child playing with plastic constructor. Toys on carpet background. Think and create. 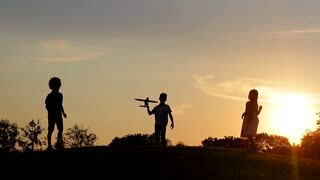 Children playing with a toy airplane on a sky background. Silhouettes of children on the background of sunset. Beautiful summer evening. Young mother with baby son is playing with a toy fish on the background of the sea.